Jerusalem - Two weeks ago, in the last essay Oliver Sacks ever published entitled “Sabbath,” he ruminated about his tenuous relationship with Judaism and how a serendipitous reunion with a long lost cousin brought the beauty of the day of rest back into his life. The cousin in question is Nobel Laureate and Hebrew University of Jerusalem Prof. Robert J. Aumann, who won the prize in economics in 2005 for his groundbreaking work in game-theory analysis. The two became close, and Aumann, 85, visited with Sacks a week before he died. During a Sunday interview in his office at the Hebrew University’s Center for the Study of Rationality in Givat Ram, Aumann said he vividly recalled his first memory of Sacks, who he did not know was his cousin until the early 1990s. Aumann, who holds a visiting professorship at Stony Brook University – where he is one of the founding members of the university’s Center for Game Theory – said he looked Sacks up the next time he was in New York, more than 20 years ago. In short order, the luminaries determined that they were first cousins, once removed, on Aumann’s maternal side. “The fact that I didn’t know we were cousins may sound a little strange, but we have a huge family,” Aumann explained. Indeed, the two struck up a close friendship, visiting one another annually in New York, as well as in Israel during Sacks’s last visit to the country a year ago to celebrate another cousin’s 100th birthday. Knowing that Sacks was nearing the end of his life, Aumann flew to New York last Sunday to visit the renowned neurologist in his Greenwich Village apartment to say a last goodbye. “He asked me what my concept was of Haolam Haba [the afterlife], and we discussed that a little bit,” Aumann said. “He was preparing for death. “I think he had a longing for religion,” Aumann added. The trauma of the encounter resulted in Sacks’s estrangement with Judaism. “That outburst really hurt him, and I think remained with him for the rest of his life,” said Aumann. “He even mentioned it in the last essay he wrote. Despite Sacks’s renunciation of religion, Aumann said his cousin still held a deep respect for Judaism. “I remember once we were sitting in a kosher restaurant in New York having dinner, and after the meal I benched [said the blessing after the meal], and when I was done he said, ‘Robert John, that was really rather fast. You must not race through it; I’m not even sure you said everything,’” he recalled. “So, he was aware of it, and that indicated that he hadn’t abandoned [Judaism] entirely. He still had a reminiscence of it, and I think some kind of longing. 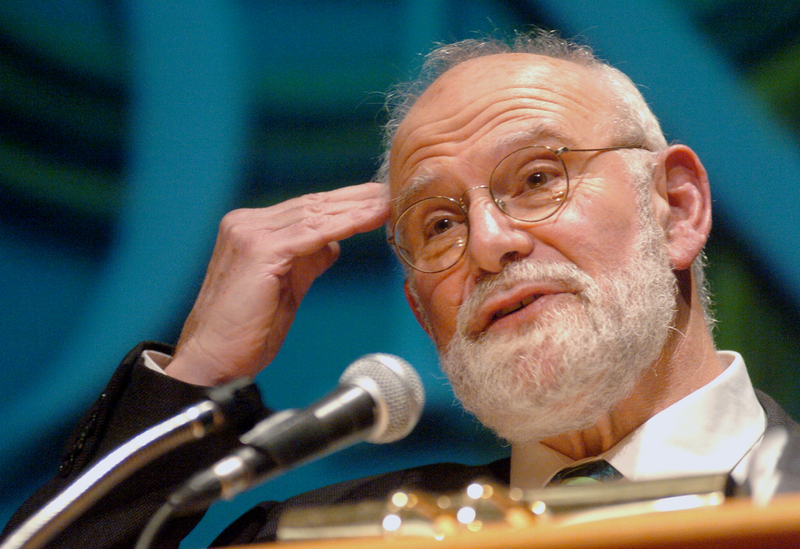 If given the chance to eulogize Sacks, Aumann said he would note his cousin’s celebrated empathy and sensitivity. “He was very sensitive to people and he had an understanding of people – especially people with difficulties,” he said. “He was a writer,” he said. It was Sacks’s ability to connect with his patients on a profound level, and help them through their seemingly insurmountable struggles, that truly made his cousin great, Aumann concluded. “He related to them like human beings, not like cases,” he said. Asked if Sacks achieved his goal of finally resting “in good conscience,” Aumann was unequivocal. In his autobiographical work Uncle Tungsten, Sacks says that after being sent away from home to a non-Jewish boarding school during the bombing in London in WW2, he gave up being religious. His grandmother was a sister of the famous Rabbi Pinchas Kohn, head of the World Aguda and formerly rov in Ansbach. But quite an outstanding family the elte-zeide was a shochet and talmid chochom, father of 18 children, who invented the Miners Safety Lamp in England which was known ever after as the Landau Lamp! A family of brains! it seems he did teshuva before he died. what a self-righteous and condescending comment!